Comm Eye Health Vol. 16 No. 45 2003 pp 01 - 02. Published online 01 March 2003. I am now aged 72. In my lifetime, the attitude of the general public in the United Kingdom towards disabled people, and their rights, has undergone a radical change. This has meant that it has been possible for lawmakers to confer a large collection of ‘rights’ on blind (and other disabled) people. At the age of eight, I joined the disability movement when glaucoma finally resulted in my becoming totally blind. I moved easily from a sighted elementary school into a residential special school for the blind. From there, my transition to Oxford University was far from easy – a major and challenging culture shock. I previously had little contact with my sighted fellows. Academic demands and the need to acquire social graces made life hard. But I survived; took my degree safely; and became a solicitor. I got a well-paid job; married; have four sons; was widowed; and was appointed a deputy Chancery Master (the first blind person in modern times to be appointed to judicial office). By courtesy of my work colleagues, all the while I had spent some of my time and energy working for various blind charities on a voluntary basis. That is where I come from. The rights of blind people? It is tempting to reply, no different from those of the sighted. We want a happy childhood; a good education (but should we be set apart or in the mainstream? ); a satisfying job; a fulfilling family life; enjoyable leisure and social activities, and the chance to take a full part in public life. We want respect; esteem; affection (if we deserve it); but above all recognition that we are citizens with full civil and human rights. Prejudice (intolerance or discrimination against a person or group) leads people to think that a blind person will always be less effective than his sighted counterpart. In those circumstances, a blind person must have ‘luck’ (not rights) to find an employer who will decide that they ‘will take a chance’. ‘Prejudice, not being founded on reason, cannot be removed by argument’ (Dr Samuel Johnson). We must, of course, accept that there are certain activities that we cannot undertake – those for which sight is essential. We cannot carry out surgical operations; or drive a car! The 1948 Universal Declaration of Human Rights mentions disability only once (Article 25). There was what one might call ‘institutionalised prejudice’ against blind people in the workplace. But, in the United Kingdom, things are different now. There have been two interrelated factors which have led to blind peoples’ rights becoming both recognised and enforceable in some countries. Consider legislation in the United Kingdom. We have the Disability Discrimination Act, 1995. Discrimination on the ground of disability is not acceptable in law, in certain fields of activity. Discrimination is defined as treating a person less favourably because of his or her disability. Since 1997, in the fifteen member states of the European Union, we have Article 13 of the consolidated treaty. This directs European Union institutions to introduce measures against discrimination based on disability. Last year saw the introduction of a directive on discrimination in employment. The United Nations is planning ‘a comprehensive and integral international convention on the protection and promotion of the rights and dignity of persons with disabilities’. This is likely to be slow-moving. However, since 1993, we have had the (not legally binding) United Nations standard rules for the equalisation of opportunities for persons with disabilities, which have had some effect on state legislation. In 1992, disability living allowance was introduced, reflecting the fact that blind people need compensation to enable them to meet the cost of increased daily living expenses. Other forms of statutory support have given blind people rights to a decent standard of living. The second half of the twentieth century saw dramatic advances in many areas of technology. First, the tape recorder; then the extraordinary progress of television. And finally, computers, with information and communication technology. Tape recorders made it much easier for blind workers to carry out clerical and administrative tasks. If they proved they could do a job as speedily and efficiently as ‘the next man’, they had a right to be employed. Access to television, as a leisure interest, enabled blind people to enjoy a mainstream activity. We have established the need for audio description of television programmes – a commentary using the natural gaps in speech to explain what is happening on the screen. The Broadcasting Act, 1996, recognised this need, and it lays down targets which broadcasters must meet – thus, giving a right to blind persons. But we are, just now, in the frustrating situation that, although we have that right, we cannot exercise it because the necessary receiving equipment is not available. Above all, computers were made accessible to blind people who quickly became programmers, analysts and trainers. But even more, a blind professional could use a computer with voice synthesis or a Braille display to access all the information available to a sighted colleague. All this sounds miraculous, and compared with twenty-five years ago, it is. But nothing moves faster than technology, and we have to run in order to stand still. For example, we have achieved an agreement that websites should be accessible to blind people, by always having text as an alternative to graphics. But these rights are not easy to enforce. We must always be watching. The individual articles in this Issue of the Community Eye Health Journal reflect a wide variety of personal experience and support for the blind and visually impaired. Sir John Wall writes of his own experience in a European country (UK) and the changes for good, with frustrations also, that he has experienced. Solomon Mekonnen movingly recounts his early years in a developing country (Ethiopia) and, with the support he received in his childhood, achieving so much both personally and in his academic life. 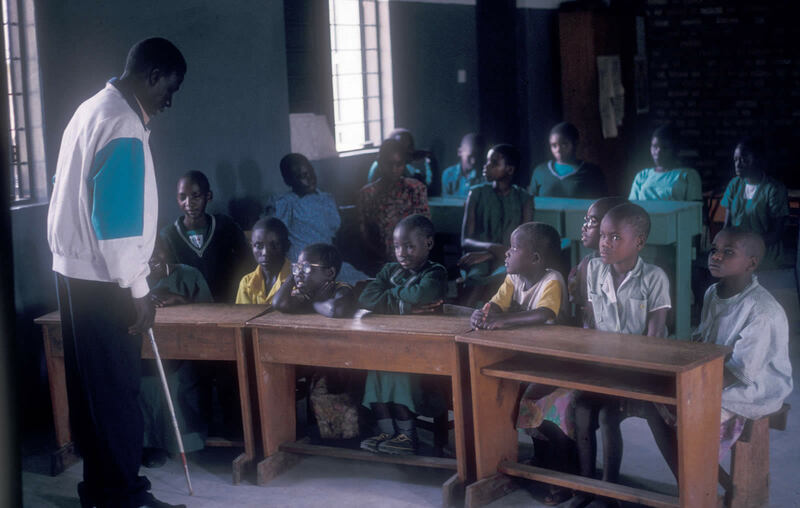 From his experience in Tanzania, Geert Vanneste brings to us the practical needs and means of providing support and help for the newly blind, while Sue Stevens shares the essential courtesies and assistance for blind and visually impaired people. This spectrum of experience, needs, support and care will surely encourage those who have the privilege of sight (and those who do not), to realise the huge potential that exists in each boy, girl, man and woman, who is blind or visually impaired – to enjoy and be blessed with a real sense of worth, respect and fulfilment in every aspect of life.